With the warm weather on its way, we thought our US readers might appreciate this list of the Top 10 Best Beaches for Dogs in the USA as named by Pet Friendly Rentals. Del Mar is one of the most popular beach communities in San Diego County. Great beaches, fairgrounds, horseracing, and a quaint, upscale village provide plenty of activities for everyone. Powerhouse Park, with a full playground, is especially nice for families with young children. Beachgoers can also find good, cheap eats at Roberto’s taco stand on Carmel Valley Road, overlooking Los Penasquitos Lagoon. Plus, the song Dog Beach Boogie helped this beach's ranking. Dr. Beach judged this beach 2005 Best Beach in America and we voted best beach for dogs. Showers and drinking water are provided. Enter the front gate by the parking lot, take your dog off-leash, walk through the L-shaped park to the back gate. Go out the back gate, down a short sandy path and onto the perfect beach for dogs and people. Doggie nirvana. Your buddy will have tons of company at this popular spot near San Diego. In fact, people may be outnumbered. 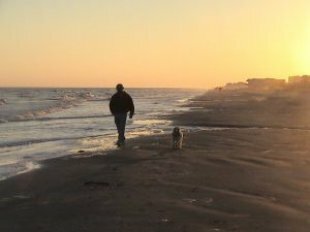 Just 35 miles south of Panama City, but feeling as if it is worlds away, Cape San Blas beaches are peaceful, not overdeveloped; in fact, you can sometimes walk a mile or two in the off season without seeing another dog…or person. The state park at the end of the cape was named 2002 Best Beach In America by Dr. Beach (a real person, not a doggie…but most doggies would agree). Only a short walk from the village of Carmel, the Carmel Beach is a beautiful and popular escape, with hotels and restaurants in walking distance. Other pet friendly beaches are close by, too. Doggie and people heaven on earth. At low tide, the beach on Hunting can literally appear to be a mile wide, with tidal pools and remote stretches rarely found today. This State Park is located near the golf resort island of Fripp, and near Beaufort, SC. Fort Funston is a popular San Francisco dogwalking location. Most visitors walk the paved Sunset Trail, a north to south route on the bluff, and reach Ocean Beach via Fort Funston's northern section. Fort Funston's stretch of Ocean Beach is where you'll see scores of dripping wet dogs, romping across the sand with driftwood stick in their mouths. No wider than a mile at its widest point, and located near renowned historic towns in the Florida Gulf, there is plenty here for man and man’s best friend. Just outside of Wilmington, NC, this beach allows dogs in all areas except swimming areas with lifeguards. If your pooch isn’t fond of windsurfing, no matter. This windsurfers’ paradise will suit them just fine. Located just outside of Oregon State Park boundaries, south of Gold Beach. 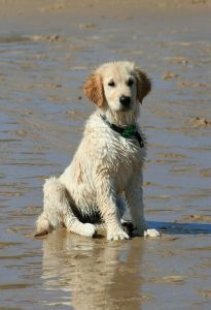 If you know of a great Dog Friendly Beach in the USA that's not on this list, why not let us know?